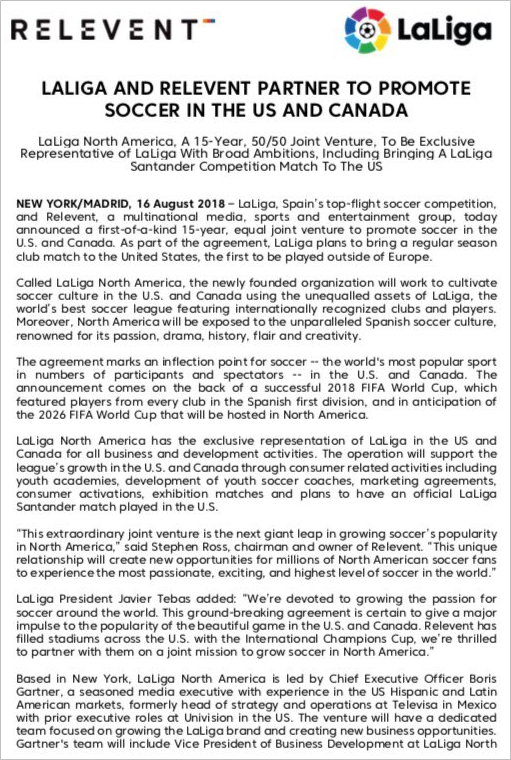 Today, the good folk at La Liga have confirmed that actual regular season Spanish league fixtures are to be played in the United States of America as part of a new 15-year partnership. La Liga have struck a deal with Relevent, an entertainment promotion group, to form a project called ‘La Liga North America’ with which they hope to promote European football culture in the US and Canada. The deal, which is part of the pre-tournament groundswell push to up the interest in the 2026 World Cup (co-hosted by the US, Canada and Mexico), will see proper competitive La Liga fixtures being hosted in American and Canadian cities – and we’re guessing it probably won’t be Huesca vs Eibar. Because who gives a flying fudgewinkle about the real, local fans of the teams involved when there’s money to be made in emerging markets? This is it – this is ‘end times’. More shall fall. It’s only a matter of time before top-level football is just one big homogeneous, conglomerate global super league, full of faceless super clubs, playing meaningless (but lucrative) International Champions Cup matches in Dallas and Singapore for the rest of time. Boring is not how La Liga describes your MOTHER! That’s right, the ENTIRE league! A, ha ha ha ha ha! At least we will FINALLY see some decent football played in the USA!! Tiresome, really. Most of the fans (particularly European) will just see this for what it is – a money spinner. There’s clearly no philanthropy involved here, or desire to ‘cultivate soccer culture’, only that to squeeze every drop out of the consumer – sorry – fan. I listened to that Charlie bloke on Talksport yesterday and he kept banging on about ‘brand and product’ blah blah. ‘Soccer’ as well – FFS. I bet the Spanish don’t even know what that word means. And Spain, ‘the worlds best soccer league’? Matter of opinion – I’m sure most US ‘soccer’ fans would actually disagree and say the Prem is the best. Everybody talks about the profile of the sport increasing year on year in the US – really? The MLS has been going for long enough now that I’d wager that we’ve hit a plateau and that it’s as good as it’s going to get in terms of popularity. It’s a bit like NFL that’s forced upon us regularly here in the UK. Some people like it, which is fine, but most aren’t really that bothered. Good luck to them; I’m sure it will interest a few more people that aren’t currently and be declared as a resounding success. They can have a look at the real deal; Historic clubs / kits / badges and team names that don’t look like something from Disney, relegation and promotion. Spot a few players who will, in their career twilight, move to the States and ply their trade in a questionable geriatric manner…and then offered interest in an emerging club funded by celebrities. Yes, but there are other considerations. Firstly it depends on the match, for example the head of La Liga has stated that the Classico won’t be held aboard. Secondly, there is no away fan culture in Spain. Fans just don’t travel so a game overseas only affects one set of fans.